I found another picture of my family taken in the early 50s, a candid shot in which no one is looking into or even seems to be aware of the camera. 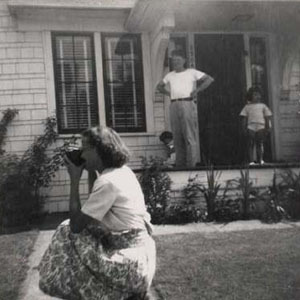 My mother crouches in the foreground, holding a camera of her own which she has aimed at something unseen that lies off to the side; my father stands farther back, hands on hips, his gaze following hers; my sisters stare off in the opposite direction altogether, oblivious to whatever it is that has drawn the interest of the grownups, and a fifth figure stands just out of sight, taking this picture of someone taking a picture, capturing four figures whose glances radiate outward beyond the fixed edges of the frame. Because I cannot tell what kind of event is being recorded — who took the shot, when, or why — and because it is impossible to determine what anyone in the picture is actually looking at, the image seems oddly empty. The more I study this snapshot, the more I seem to see an image on the verge of vanishing.